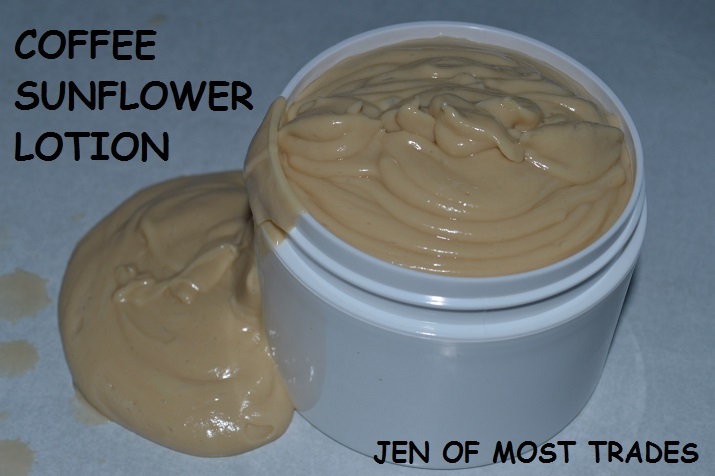 I literally just fell in love with my new lotion recipe! After some research, I found that my favorite oil, Coconut, isn’t the only oil that’s great for our skin! Enter…Sunflower Oil. It contains vitamin E that is known to be very beneficial for our beautiful skin! It smells so good, and contains ingredients good for us! I got all of the ingredients (besides the coffee) from Mountain Rose Herbs. In a double boiler, melt sunflower oil, cocoa butter, and emulsifying wax together. Remove from heat and pour into bowl for mixing. Mix for a little bit, maybe one minute, and stop. Let it cool a bit, and Mix for another minute. Continue this just a couple times until it’s the consistency of lotion and everything is well combined. You can add a little bit of vitamin E oil (1/2 tsp) to give it a little extra boost for shelf life if you want, and mix again. Pour into a one pint mason jar, or other jar(s) for storage. It should last a good month or more. If it smells, looks, or feels different after a while, you will have to throw it out. I hope you enjoy this yummy smelling and ahhhhmazing feeling lotion as much as I do!!! Here’s a little extra tip….use it as a shaving lotion too! It will keep you from using store bought, chemical laden brands and save you money! Also you’ll feel moisturized afterwards too! Win – Win! How do you like this lotion! ?